Many individuals face the triple whammy of limited assets, low income and poor credit. When people in these circumstances face a financial emergency, same day payday loans may seem like a lifeline. In reality, same day payday loans are a trap that can endure for months, even years. Who has time for that? LoanNow provides an alternative means to obtain the cash you need while helping to improve your overall financial circumstances. Same day payday loans from payday loan stores require borrowers to submit information about their jobs and bank accounts. Upon approval, borrowers must provide one or more post-dated checks that are deposited on the designated repayment date – whether or not there is actually money in the bank to cover the deposit. However, it’s possible to place a stop payment on the check(s) if needed. Online payday lenders rarely have the capacity to provide same day payday loans. This is because online payday loan disbursements are usually handled through the Automated Clearing House (ACH) system, which usually requires at least one business day. Repayment takes place through the ACH system as well, although withdrawal attempts occur immediately. It’s more difficult to place a stop payment on an ACH authorization than on an actual check. In some cases, lenders make multiple ACH withdrawal attempts, and each unsuccessful attempt often generates NSF fees from the borrower’s bank. Some desperate borrowers close their bank accounts to stop the process. One thing that same day payday loans from payday loan stores or ACH loans from online payday lenders have in common is their unrealistically short repayment periods. 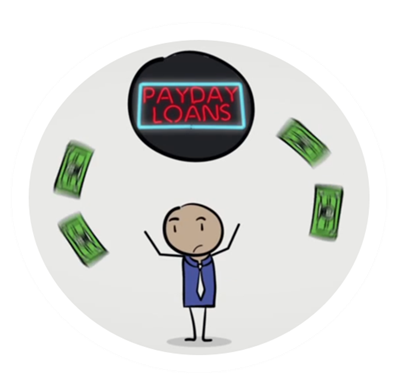 Many borrowers are unable to repay their loans in full – which triggers the rollover payday loan trap. Each rollover is essentially a new loan, with its own set of interest charges and administrative fees. After just a few rollovers, many borrowers find that they owe more than their original loans. That’s just ridiculous. You don’t need to resort to same day payday loans to deal with financial emergencies. LoanNow provides the convenience of applying online and receiving your funds through the ACH system. We also consider your entire financial picture, not just your FICO score. We say yes to many applicants turned down by banks. Our loan repayments are structured in manageable monthly installments that work with your budget. And we say no to rollovers. Why not try the LoanNow alternative for yourself?